Get to know more about Merkel Carpet One by watching our "What We Do" video. For 3 generations Merkel has provided the quality benchmark for Washtenaw county homeowners. From humble beginnings in 1924 to award winning fashion forward designs today, you can trust Merkel's design staff to create one of a kind rooms, at affordable prices. 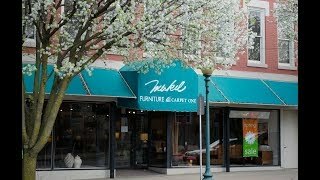 Whether its quality home furnishings and flooring in our downtown Chelsea store, or a vast selection of the best brands of flooring in our Ann Arbor store we are confident that you'll find the style you envision with the best service imaginable! Professionally trained interior designers available every day. Complimentary design services available with minimum furniture purchase. Builder discounts are available for larger projects. Interest deferred financing available. Free in-home measures. Delivery and Installation. We offer some of the best brands available including: Henredon, Sherrill, Harden, Hancock & Moore, Dinec, Karastan, Lees, Bigelow, Ekornes, Carpet One, Adura, Tile Optima, Armstrong, Stainmaster, Sealy Posturepedic, Stearns and Foster and more. To learn more about our selection of furniture, mattresses, and other home accessories, check out the Merkel Furniture and Carpet One website!